According to the emergency services, the father, aged 48, tried to save his 18-year-old son after he fell into the sea at the Los Barqueros beach in the northern town. The alarm was raised by witnesses who rang police to say that both men were in difficulty in the choppy waters. Rescuers managed to recover one of the two men from the water but he failed to respond to attempts to revive him on the shore. The other body was located several hours later after an extensive air and sea search. Another tragedy almost occurred the previous day on the north coast also. Two swimmers and four local lifeguards who went into the sea at Playa Jardín to help the latter had to be rescued by boat after they were unable to return to shore due to the strong currents. 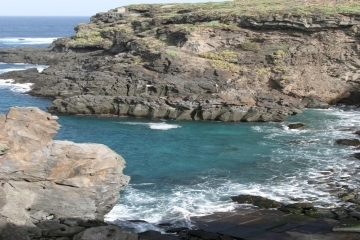 The two swimmers, both foreign tourists, were admitted to a local hospital for treatment afterwards. 24 hours earlier, a 55-year-old Dutch man died on Friday while taking part in an organised dive off the Las Eras beach in Arico.